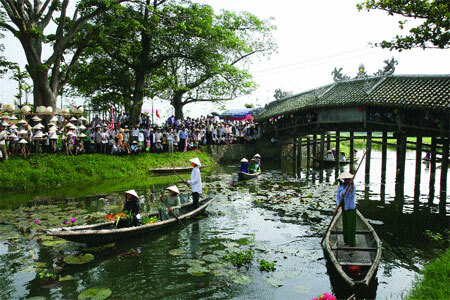 In Thuy Thanh Commune, tourists are captivated by the tile-roofed ancient Thanh Toan Bridge, which is no less famous than the historical Truong Tien Bridge of Hue. Built in 1776 by the sixth descendant of the Tran royal family Tran Thi Dao, the bridge bears a unique wooden structure: "house above, bridge below". It has seven compartments, while the roof is made of crystal gem tiles. Thanh Toan is said to be the rarest, most artistic and most valuable of all ancient bridges in Viet Nam. Along with the biennial Hue Festival, Thuy Thanh Commune also organises the rural market festival, which re-enacts the atmosphere of an ancient market with sales and purchases and display of agricultural products, arts and crafts. Travellers are invited to try traditional Hue dishes such as mussel rice and vermicelli. At night, the local people interact with tourists in art performances. In Thuy Thanh, tourists also observe with appreciation elderly farmers present farming activities, which look quite simple but are, in fact, inspiring. Activities such as husking, ploughing and singing lullabies to children are the most favourite ones of travellers. Tran Thi Dieu, Nguyen Thi Kinh and Nguyen Thi Hai are three of the most outstanding farmers who have successfully made a mark in the tourism industry in their twilight years, and have amazed travellers. Not only that, they have found ways to make the most of household chores. Part of the festival market for many years, the village has become a must-visit for tourists each time they visit Hue City. According to a recent survey by the city, more travellers visit Thuy Thanh than other destinations such as Phuoc Tich, Kim Long, Vy Da and Thuy Bieu, besides Bao Vinh, as this commune tops the Hue Festival tourism list. Tran Duy Khanh, chairman of the Thuy Thanh People Committee, said various English classes have been organised so that local people can communicate with tourists, while offering local food and doing gardening. 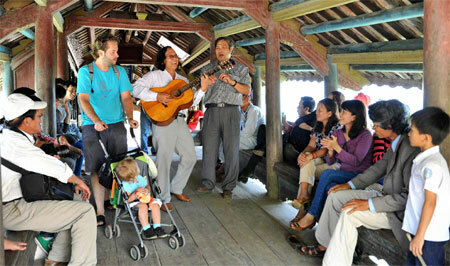 "Community tourism is a new kind of business that draws tourists and is becoming a trend. In 2014, the number of travellers to Thuy Thanh was 1,000, which rose to more than 6,000 at the beginning of this year. Our village is honoured to be selected as the ideal destination in the ‘Sustainable and Responsible Tourism' project in the central region," Khanh said.